American engineer mission specialist astronaut 1984-2010. NASA flight engineer. Status: Inactive; Active 1984-2010. Born: 1951-04-15. Spaceflights: 5 . Total time in space: 55.91 days. Birth Place: Baltimore, Maryland. EDUCATION: Graduated from Nether Providence High School, Wallingford, Pennsylvania, in 1969; received a bachelor of science degree in aerospace engineering from the University of Colorado in 1973. 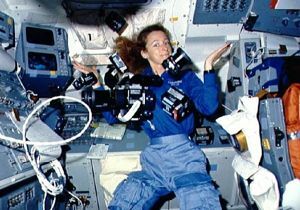 A veteran of five space flights, (STS-32 in 1990, STS-46 in 1992, STS-62 in 1994, STS-81 in 1997, and STS-98 in 2001), Ms. Ivins has logged over 1,318 hours in space. Ms. Ivins was assigned to the Astronaut Office supporting the Space Shuttle, Space Station and Constellation Branches. �She departed NASA on December 31, 2010. SPACE FLIGHT EXPERIENCE:� STS-32 (January 9-20, 1990) launched from the Kennedy Space Center, Florida, on an eleven-day flight, during which crew members on board the Orbiter Columbiasuccessfully deployed a Syncom satellite, and retrieved the 21,400-pound Long Duration Exposure Facility (LDEF).� Mission duration was 261 hours, 1 minute, and 38 seconds.� Following 173 orbits of the Earth and 4.5 million miles, Columbia returned with a night landing at Edwards Air Force Base, California. STS-46 (July 31-August 8, 1992) was an 8-day mission, during which crew members deployed the European Retrievable Carrier (EURECA) satellite, and conducted the first Tethered Satellite System (TSS) test flight. �Mission duration was 191 hours, 16 minutes, and 7 seconds.� Space Shuttle Atlantis and her crew launched and landed at the Kennedy Space Center, Florida, completing 126 orbits of the Earth in 3.35 million miles. STS-62 (March 4-18, 1994) was a 14-day mission for the United States Microgravity Payload (USMP) 2 and Office of Aeronautics and Space Technology (OAST) 2 payloads.� These payloads studied the effects of microgravity on materials sciences and other space flight technologies.� Other experiments on board included demonstration of advanced teleoperator tasks using the remote manipulator system, protein crystal growth, and dynamic behavior of space structures.� Mission duration was 312 hours, 23 minutes, and 16 seconds.� Space Shuttle Columbia launched and landed at the Kennedy Space Center, Florida, completing 224 orbits in 5.82 million miles. STS-81 Atlantis (January 12-22, 1997) was a 10-day mission, the fifth to dock with Russia's Space Station Mir, and the second to exchange U.S. astronauts.� The mission also carried the Spacehab double module providing additional middeck locker space for secondary experiments. In five days of docked operations more than three tons of food, water, experiment equipment and samples were moved back and forth between the two spacecraft.� Following 160 orbits of the Earth the STS-81 mission concluded with a landing on Kennedy Space Center's Runway 33 ending a 3.9 million mile journey.� Mission duration was 244 hours, 56 minutes. Born April 15, 1951, in Baltimore, Maryland. She enjoys flying, reading, baking. Her parents, Dr. and Mrs. Joseph L. Ivins, reside in Wallingford, Pennsylvania. Graduated from Nether Providence High School, Wallingford, Pennsylvania, in 1969; received a bachelor of science degree in aerospace engineering from the University of Colorado in 1973. Ms. Ivins has been employed at the Lyndon B. Johnson Space Center since July 1974, and until 1980, was assigned as an engineer, Crew Station Design Branch, working on Orbiter Displays and Controls and Man Machine Engineering. 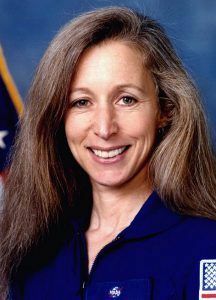 Her major assignment in 1978 was to participate in development of the Orbiter Head-Up Display (HUD). In 1980 she was assigned as a flight engineer on the Shuttle Training Aircraft (Aircraft Operations) and a co-pilot in the NASA administrative aircraft (Gulfstream-1). Ms. Ivins holds a multi-engine Airline Transport Pilot License with Gulfstream-1 type rating, single engine airplane, land, sea, and glider commercial licenses, and airplane, instrument, and glider flight instructor ratings. She has logged over 5,700 hours in civilian and NASA aircraft. Ms. Ivins was selected in the NASA Astronaut Class of 1984 as a mission specialist. Her technical assignments to date include: crew support for Orbiter launch and landing operations; review of Orbiter safety and reliability issues; avionics upgrades to the Orbiter cockpit; software verification in the Shuttle Avionics Integration Laboratory (SAIL); Capsule Communicator (CAPCOM) in Mission Control; crew representative for Orbiter photographic system and procedures; crew representative for Orbiter flight crew equipment issues; Lead of Astronaut Support Personnel team at the Kennedy Space Center in Florida, supporting Space Shuttle launches and landings. A veteran of four space flights, (STS-32 in 1990, STS-46 in 1992, STS-62 in 1994, and STS-81 in 1997), Ms. Ivins has logged over 1009 hours in space. STS-32 (January 9-20, 1990) launched from the Kennedy Space Center, Florida, on an eleven-day flight, during which crew members on board the Orbiter Columbia successfully deployed a Syncom satellite, and retrieved the 21,400 pound Long Duration Exposure Facility (LDEF). Mission duration was 261 hours, 1 minute, and 38 seconds. Following 173 orbits of the Earth and 4.5 million miles, Columbia returned with a night landing at Edwards Air Force Base, California. STS-46 (July 31-August 8, 1992) was an 8-day mission, during which crew members deployed the European Retrievable Carrier (EURECA) satellite, and conducted the first Tethered Satellite System (TSS) test flight. Mission duration was 191 hours, 16 minutes, and 7 seconds. Space Shuttle Atlantis and her crew launched and landed at the Kennedy Space Center, Florida, completing 126 orbits of the Earth in 3.35 million miles. STS-62 (March 4-18, 1994) was a 14-day mission for the United States Microgravity Payload (USMP) 2 and Office of Aeronautics and Space Technology (OAST) 2 payloads. These payloads studied the effects of microgravity on materials sciences and other space flight technologies. Other experiments on board included demonstration of advanced teleoperator tasks using the remote manipulator system, protein crystal growth, and dynamic behavior of space structures. Mission duration was 312 hours, 23 minutes, and 16 seconds. Space Shuttle Columbia launched and landed at the Kennedy Space Center, Florida, completing 224 orbits in 5.82 million miles. STS-81 (January 12-22, 1997) was a 10-day mission, the fifth to dock with Russia's Space Station Mir, and the second to exchange U.S. astronauts. The mission also carried the Spacehab double module providing additional middeck locker space for secondary experiments. In five days of docked operations more than three tons of food, water, experiment equipment and samples were moved back and forth between the two spacecraft. Following 160 orbits of the Earth the STS-81 mission concluded with a landing on Kennedy Space Center's Runway 33 ending a 3.9 million mile journey. Mission duration was 244 hours, 56 minutes. Family: Astronaut. Country: USA. Spacecraft: ISS, Mir. Flights: STS-32, STS-46, STS-62, STS-81, STS-81 Mir NASA-3, STS-98. Projects: STS. Bibliography: 12, 5559. 1951 April 15 - . Birth of Marsha Sue Ivins - . Nation: USA. Related Persons: Ivins. American engineer mission specialist astronaut 1984-2010. NASA flight engineer. 5 spaceflights, 55.9 days in space. Flew to orbit on STS-32 (1990), STS-46, STS-62, STS-81, STS-98..
1994 March 4 - . 13:53 GMT - . Launch Site: Cape Canaveral. Launch Complex: Cape Canaveral LC39B. Launch Platform: MLP1. LV Family: Shuttle. Launch Vehicle: Space Shuttle. STS-62 - . Call Sign: Columbia. Crew: Allen, Andy, Casper, Gemar, Ivins, Thuot. Payload: Columbia F16 / USMP-2 / OAST-2. Mass: 8,870 kg (19,550 lb). Nation: USA. Related Persons: Allen, Andy, Casper, Gemar, Ivins, Thuot. Agency: NASA Houston. Program: STS. Class: Manned. Type: Manned spaceplane. Flight: STS-62. Spacecraft Bus: Shuttle. Spacecraft: Columbia. Duration: 13.97 days. Decay Date: 1994-03-31 . USAF Sat Cat: 23025 . COSPAR: 1994-015A. Apogee: 309 km (192 mi). Perigee: 246 km (152 mi). Inclination: 39.00 deg. Period: 90.40 min. Carried USMP-2, OAST-2, SAMPIE, TES, EISG. Payloads: United States Microgravity Payload (USMP) 2, Office of Aeronautics and Space Technology (OAST) 2, Dexterous End Effector (DEE), Shuttle Solar Backscatter Ultraviolet/A (SSBUV/A), Limited-Duration Space Environment Candidate Material Exposure (LDCE), Advanced Protein Crystal Growth (APCG), Physiological Systems Experiment (PSE), Commercial Protein Crystal Growth (CPCG), Commercial Generic Bioprocessing Apparatus (CGBA), Auroral Photography Experiment Phase B (APE-B), Middeck Zero-Gravity Dynamics Experiment (MODE), Air Force Maui Optical Site (AMOS) Calibration Test, Bioreactor Demonstration System A. 1994 March 18 - . Landing of STS-62 - . Return Crew: Allen, Andy, Casper, Gemar, Ivins, Thuot. Nation: USA. Related Persons: Allen, Andy, Casper, Gemar, Ivins, Thuot. Program: STS. Flight: STS-62. STS-62 landed at 13:10 GMT. .
1997 January 12 - . 09:27 GMT - . Launch Site: Cape Canaveral. Launch Complex: Cape Canaveral LC39B. Launch Platform: MLP2. LV Family: Shuttle. Launch Vehicle: Space Shuttle. STS-81 - . Call Sign: Atlantis. Crew: Baker, Mike, Grunsfeld, Ivins, Jett, Linenger, Wisoff. Payload: Atlantis F18 / Spacehab Double Module. Mass: 115,900 kg (255,500 lb). Nation: USA. Related Persons: Baker, Mike, Grunsfeld, Ivins, Jett, Linenger, Wisoff. Agency: NASA Houston. Program: Mir. Class: Manned. Type: Manned spaceplane. Flight: Soyuz TM-24, STS-79 Mir NASA-2, STS-81, STS-81 Mir NASA-3. Spacecraft Bus: Shuttle. Spacecraft: Atlantis. Duration: 10.20 days. Decay Date: 1997-01-22 . USAF Sat Cat: 24711 . COSPAR: 1997-001A. Apogee: 380 km (230 mi). Perigee: 343 km (213 mi). Inclination: 51.70 deg. Period: 91.80 min. After a night launch of Space Shuttle Atlantis, the Shuttle docked with Mir at 03:55 GMT on January 14. STS-81 transferred 2,715 kg of equipment to and from the Mir, the largest transfer of items to that date. During the docked phase, 640 kg of water, 515 kg of U.S. science equipment, 1,000 kg of Russian logistics, and 120 kg of miscellaneous material were transferred to Mir. Returned to Earth aboard Atlantis were 570 kg of U.S. science material, 405 kg of Russian logistics and 98 kg of miscellaneous material. At 02:16 GMT January 19, Atlantis separated from Mir after picking up John Blaha, who had arrived aboard STS-79 on September 19, 1996, and dropping off Jerry Linenger, who was to stay aboard Mir for over four months. The Shuttle backed off along the -RBAR (i.e. toward the Earth) to a distance of 140 m before beginning a flyaround at 02:31 GMT. Most of the flyaround was at a distance from Mir of 170 m. The first 'orbit' around Mir was complete at 03:15, and the second was completed at 04:02 GMT. Then the Orbiter fired its jets to drift away from the orbit of Mir. NASA's first Shuttle mission of 1997 came to a close with a landing at the Kennedy Space Center at 14:22 GMT on January 22 (after the first opportunity was waved off due to cloud cover at the Cape). 1997 January 22 - . Landing of STS-81 - . Return Crew: Baker, Mike, Blaha, Grunsfeld, Ivins, Jett, Wisoff. Nation: USA. Related Persons: Baker, Mike, Blaha, Grunsfeld, Ivins, Jett, Wisoff. Program: Mir. Flight: Soyuz TM-24, STS-79 Mir NASA-2, STS-81, STS-81 Mir NASA-3. STS-81 landed at 14:22 GMT with the crew of Baker Mike, Jett, Wisoff, Grunsfeld, Ivins and Blaha aboard..
2001 January 3 - . 2001 January 11 - . ISS Status Report: ISS 01-02 - . Nation: USA. Related Persons: Cockrell, Curbeam, Gidzenko, Ivins, Jones, Polansky, Shepherd. Program: ISS. Flight: Soyuz TM-31. 2001 January 17 - . ISS Status Report: ISS 01-03 - . Nation: USA. Related Persons: Cockrell, Curbeam, Gidzenko, Ivins, Jones, Polansky, Shepherd. Program: ISS. Flight: Soyuz TM-31. 2001 January 31 - . 2001 February 7 - . STS-98 Mission Status Report #01 - . Nation: USA. Related Persons: Burbank, Cockrell, Curbeam, Gidzenko, Ivins, Jones, Polansky, Shepherd. Program: ISS. Flight: Soyuz TM-31, STS-98. 2001 February 7 - . 23:13 GMT - . Launch Site: Cape Canaveral. Launch Complex: Cape Canaveral LC39A. Launch Platform: MLP2. LV Family: Shuttle. Launch Vehicle: Space Shuttle. STS-98 - . Call Sign: Atlantis. Crew: Cockrell, Curbeam, Ivins, Jones, Polansky. Payload: Atlantis F23. Mass: 90,225 kg (198,912 lb). Nation: USA. Related Persons: Cockrell, Curbeam, Ivins, Jones, Polansky. Agency: NASA Houston. Manufacturer: Boeing. Program: ISS. Class: Manned. Type: Manned spaceplane. Flight: STS-98. Spacecraft Bus: Shuttle. Spacecraft: Atlantis. Duration: 12.89 days. Decay Date: 2001-02-20 . USAF Sat Cat: 26698 . COSPAR: 2001-006A. Apogee: 337 km (209 mi). Perigee: 183 km (113 mi). Inclination: 51.30 deg. Period: 89.71 min. ISS Assembly flight. Launch delayed from January 18 and February 6. International Space Station assembly mission; delivered the Destiny and PMA-2 modules. Destiny was an American ISS module, an 8.4 meter long and 4.2 meter wide cylindrical structure with a mass of 15 tonnes. It was to function as a science and technology module and the primary control module for the ISS. The shuttle orbiter was placed in an initial 74 x 323 km x 51.6 deg orbit. At 2357 GMT the OMS engines fired for the OMS-2 burn which raised Atlantis' orbit to 204 x 322 km x 51.6 deg. Atlantis docked with the Station at 1651 GMT on February 9 at the PMA-3 port on Unity's nadir. At 1500 GMT on Feb 10 Marsha Ivins used the RMS arm to unberth the PMA-2 docking port from Unity. Tom Jones and Bob Curbeam then conducted three spacewalks on Februay 10 to 14 to attach the Destiny and PMA-2 modules to the station. The crew also delivered over a tonne of food, fuel and equipment to the ISS. Atlantis undocked from Alpha at 1406 GMT on February 16. Atlantis landed at Edwards AFB on February 20; plans to land on February 18 and 19 were called off due to persistent wind problems at Kennedy Space Center. The deorbit burn was at 1927 GMT and lowered the orbit from 370 x 386 km to about 50 x 380 km. The nominal entry interface at 122 km came at 2002 GMT and touchdown on runway 22 was at 20:33 GMT. On March 1 Atlantis was flown on the back of NASA's SCA 911 carrier aircraft to Altus AFB, Oklahoma, en route to Kennedy. 2001 February 8 - . STS-98 Mission Status Report #02 - . Nation: USA. Related Persons: Cockrell, Curbeam, Gidzenko, Ivins, Jones, Polansky, Shepherd. Program: ISS. Flight: Soyuz TM-31, STS-98. STS-98 Mission Status Report #03 - . Nation: USA. Related Persons: Cockrell, Curbeam, Ivins, Jones, Polansky. Program: ISS. Flight: Soyuz TM-31, STS-98. 2001 February 18 - . 2001 February 19 - . STS-98 Mission Status Report #24 - . Nation: USA. Related Persons: Cockrell, Curbeam, Gidzenko, Ivins, Jones, Polansky, Shepherd. Program: ISS. Flight: Soyuz TM-31, STS-98. 2001 February 20 - . STS-98 Mission Status Report #26 - . Nation: USA. Related Persons: Cockrell, Curbeam, Gidzenko, Ivins, Jones, Polansky, Ross, Shepherd. Program: ISS. Flight: Soyuz TM-31, STS-98. Landing of STS-98 - . Return Crew: Cockrell, Curbeam, Ivins, Jones, Polansky. Nation: USA. Related Persons: Cockrell, Curbeam, Ivins, Jones, Polansky. Program: ISS. Flight: STS-98. STS-98 landed at 20:33 GMT. .